Poor sleep: no malaria dreams, but a dog whose sole purpose on earth, it thought, was to bark all night. Intermittent rain on the roof. A cacophony of roosters that, in my sleep mind, were people watching a football match and cheering. He was born at the zoo by surprise and his mom, a ‘problem jaguar’ rejected him so here he is! A positive interview at the Institute of Archaeology and I was on top of the world. Soursop juice tasted like victory. I bought packets of soursop, tamarind, and horchata Tang. It made me wonder if, at this point, Tang exists only in Latin America. I think the last time I drank Tang was in Guatemala in 2003. I discovered a live fish could live in a mixture of cheap rum and Tang for over half an hour. There were live fish in our drinking water. I had poured him in without noticing, mixed everything up, then left the drink while I had a meeting. It is no wonder people got dysentery. 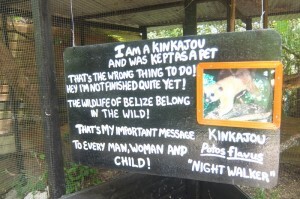 Don’t keep kinkajous as pets! Be proud of them! Walking away from the Institute of Archaeology with my juice and my Tang I decided what I had done in the morning counted as a victory and I could celebrate with a trip to the Belize zoo. I bought a slice of pizza at the bus station, mushed on to the bus, and set out along the Western Highway. Past Amigos (is JB’s gone? Probably. Heck, JB is probably gone), past Monkey Bay, past Cheers, and off the bus. 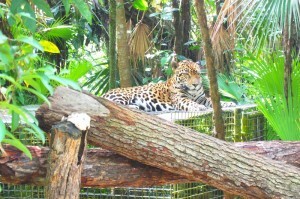 The motto of the Belize Zoo is “the best little zoo in the world”. Frankly I think it is the best zoo in the world. It is the best one I have ever encountered. No surprise: I find zoos mostly terrifying. Say what you will, animals out of context feel like artefacts out of context. A wilting polar bear on a hot day in California or a lion facing a Scottish winter should, I think, seem insane to any reasonable person. As an undergraduate I spent a few hours sitting in front of the gorilla pen at the Boston Zoo completing an observation assignment for some sort of physical anthropology course. I watched them whap each other, play with their baby, do their thing…and I thought “what are you guys DOING here”. I just wrote up the whapping and the baby playing for the assignment. Sure this coatimundi is an albino but he is doing fine at the zoo. I watched him snuffle around. 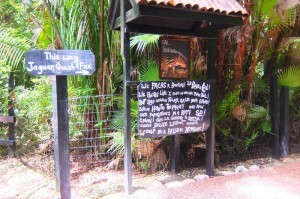 The Belize Zoo isn’t like that. Not at all. In this bushy area you only meet animals from Belize who are chilling in temperatures they are used to, around plants that they are used to: contextualized. The animals in the zoo are all there for a reason. 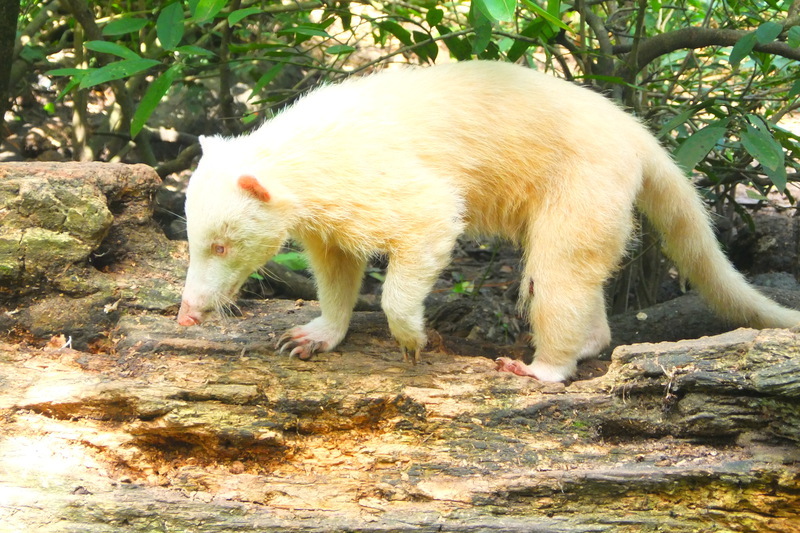 Some have issues: a stork that fell out of a tree and now can’t fly, an albino coatimundi, a deer with malformed antlers. Some are rescues that became partially tame during rehab: an ocelot brought back from the brink after a hurricane, a hawk that refused to be reintroduced to the wild. Finally some have had bad scrapes with humans: the baby, born in the zoo, of a pregnant jaguar that was eating farmer’s livestock, a tapir that had been shot in the face. The worst, in my book, are the victims of the illicit trade in animals: a black jaguar that nearly starved to death in a cage that no one thought would live. Birds with their wings clipped saying human words. 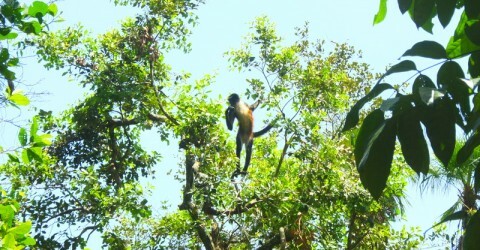 Of course there were some monkeys doing their thing, not even in a cage or anything. They just rock it at the zoo which is their territory. 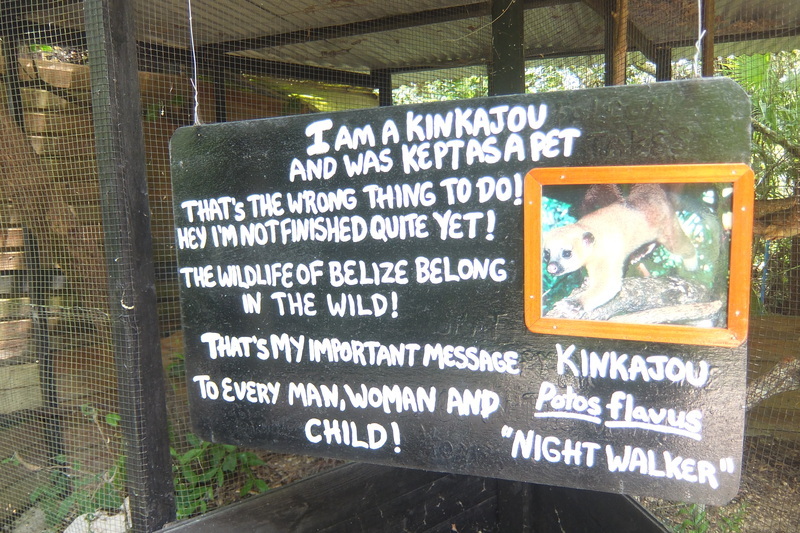 The Belize Zoo is filled with hand-painted signs with cute rhymes about the animals. 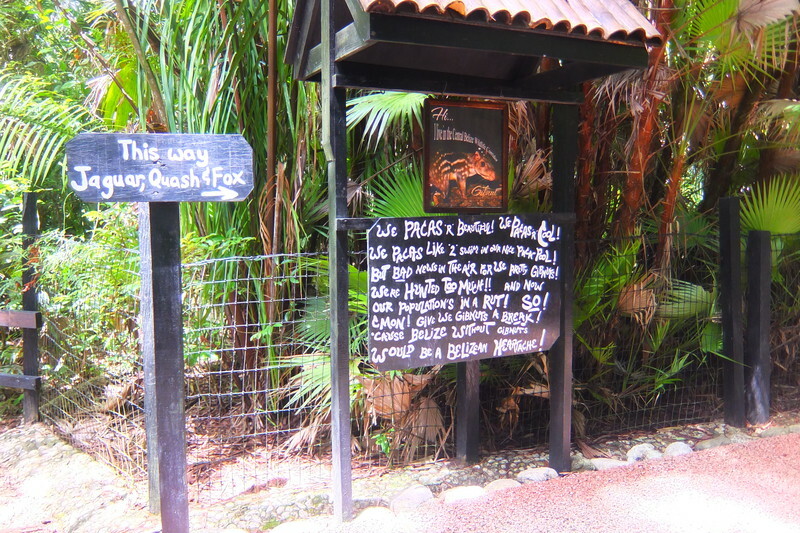 Catchy and useful, each sign is meant to instill a sense of pride in visitors about the natural abundance of Belize and to dispel folk falsehoods about animals. Animal smuggling and pet keeping is wrong, these animals don’t harm humans or livestock, hunting common animals leaves nothing to eat for rare animals. The word “heritage” was everywhere. I watched a monkey eat a banana. I missed the bus a few times on the way out while chatting with the security guard. Back in Belmopan I bought a mango and two Belkins but the lady who owned my guest house asked if I wanted to get a beer at the nearby cevicheria and I said yes. We had two and I had ceviche for the first time in a while. In Belize, apparently, you eat ceviche with chips, not a spoon. It was pleasant.